This page is a translated version of the page Meisterstück and the translation is 100% complete. In 1924, after a restyling of its production which was divided into different ranges of quality, Montblanc began using the Meisterstuck (masterpiece) name to indicate its higher-end pens, coming with a lifetime warranty, also adopting the marking of the 4810 monogram with reference to the Mont Blanc height. The same masterpiece title was also adopted in the foreign market, and are therefore pen were marked Masterpiece in Britain and the United States, Cheuf d'Ouvre in France and Capolavoro in Italy. However, one must keep in mind that the Meisterstück name does not identify a precise model or line, as the company tries to make it to appear in the historiography published in its official website where, unfairly, a 149 that originates instead in 1952 is reported in 1924. 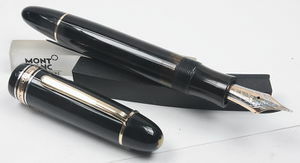 This pen is also grandly referred to as the "symbol par excellence" for the culture of writing, trying to figure that it is the same model, "an icon of a timeless design", of such an high quality that it always remained in production until since 1924 (the quotes are cited from the description on the website cited at March 9, 2009, subsequently amended). In fact the 1924 models are totally different than 149 and the Meisterstück name did not identify at all a specific model or a model line, but it was the name used by Montblanc to indicate from time to time what the company considered to be its top models. Initially it also implied a lifetime warranty, similar to the Lifetime mark used by Sheaffer. Various models to which was given the Meisterstück name have in fact followed each other over the years, with very different shapes and styles, starting whith the first ones of the '20s, to pass to the the 100, 120 and 130 series, to the next 140 series and the 640 and 740 series. This page was last edited on 16 December 2018, at 17:43.